Are their certain movies you could watch over and over? Some guilty pleasure you have to pause on every time it's on cable? While I tend to like movies and shows I have not seen before, Doug has several movies that he has watched thousands of times. If Knocked Up, I Love You Man or The Preacher's Wife is on he just can't look away. Maybe it's a male female thing? Maybe I just bore easily? While I can't handle watching the same movie over and over I do love certain dishes so much that I can eat them night after night. This Cauliflower Purée is one of those dishes. I must have made it every other night for dinner last winter before I burned out on it's deliciousness. Recently while flipping through my recipe notes I discovered it again and re-ignited my obsession. Smooth, creamy and utterly delicious I think I may be be eating these night after night again this winter! Gently steam cauliflower in a steamer basket over a pan of boiling water. 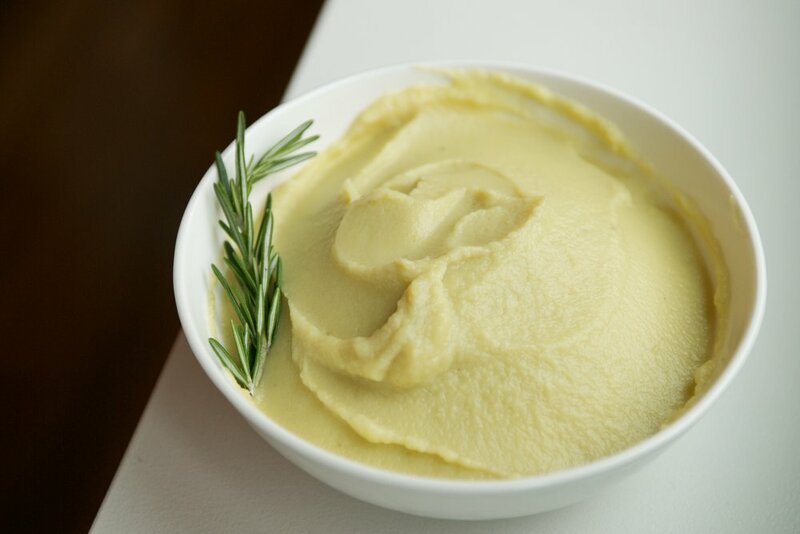 Purée cauliflower in a Vitamix or high speed blender with remaining ingredients until smooth. You may need to add more almond milk to facilitate blending.